Staple diet: Sacks of wheat at a market in Haryana. India, the world’s second biggest wheat consumer, has bought 1.79mt since July. Three international companies, Glencore International AG, Cargill Inc., and Toepfer International are competing to sell wheat to India at a tender on Monday as record prices push up the cost of replenishing stockpiles, said a government official, who didn’t want to be identified. 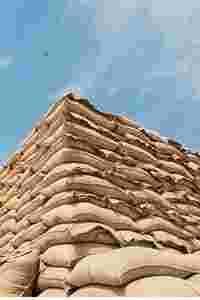 The State Trading Corp. of India Ltd wants to buy 350,000 tonnes of the grain, part of a government plan to import 1 million tonnes (mt) through three state-owned trading firms. India paid $396 (Rs15,602) a tonne for 150,000 tonne on 7 December. Wheat rose above $10 a bushel for the first time on Monday on concern dry weather in Argentina, the world’s fourth biggest exporter, will cause global supplies to shrink. India’s harvest may fall unless the main growing states receive more rainfall, farm secretary P.K. Mishra said last week. Wheat prices in Chicago have risen 9% since the State Trading called bids to buy 350,000 tonnes on 10 December. State-run PEC Ltd on 7 December bought 150,000 tonnes from J.K. International Pty. Ltd at $396 a tonne and MMTC Ltd last month paid an average $400.19 a tonne for 342,500 tonnes from Glencore and Cargill. India, the world’s second biggest wheat user, has bought 1.79mt since July, helping support this year’s doubling in prices on the Chicago Board of Trade. Stagnant output may force it to import wheat for a third year in 2008, Mishra said on 13 December. The area planted for wheat, the nation’s most important crop over winter, was 12% less than a year earlier because of inadequate soil moisture in the growing areas. India expects to harvest 75.5mt, the biggest since 2000, up from 75mt in the year ended June. State warehouses held 9mt on 23 November, enough to meet demand for nine months, the Food Corp. of India, the nation’s biggest buyer of grains, said last month. Prices have more than doubled in the past year as drought and increased demand eroded global inventories. The state trading is seeking 65,000 tonnes of wheat at Mundra and 45,000 tonnes at Kandla on the west coast; 40,000 tonnes each at Chennai, Vishakhapatnam, Tuticorin and 50,000 tonnes at Kakinada, all in south India. It is seeking 35,000 tonnes each at Cochin and Mumbai ports.